It was going to be a great night. Scratch that – it had to be a great night. The New Orleans Saints, who were trounced a week earlier by the Philadelphia Eagles, were on the verge of watching their season derail into an afterthought. A loss would begin talk of “the future,” “playing younger guys,” and “who should be cut.” And it would all come at the hands of their archrivals, the undefeated Atlanta Falcons. It had to be a great night. Pre-game, the Saints and the NFL would honor the wheelchair bound Steve Gleason with the George Halas Award for overcoming adversity. The 38-year-old Gleason is paralyzed with ALS. 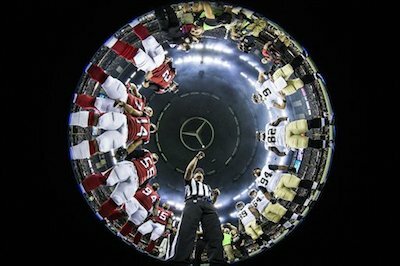 For anyone who has just moved to this planet – in 2006, Gleason, a Saints special-teamer, blocked the punt for a touchdown against the Atlanta Falcons in the Saints first game in the Superdome post-Katrina. In that crowd, with the Black and Gold faithful, sat one Mike Mauti. A kid who was playing high school football on the North Shore, at Mandeville High School. Mauti would later go on to play college football at Penn State University, and be drafted by the Minnesota Vikings, only to be cut this year in training camp. Then the Saints came calling – claiming Mauti off of waivers, giving him the opportunity to join the same team his father, Rich Mauti, played for from 1977-83. A strange, unexpected circle completing itself. Another circle completed itself Thursday night as well. For, early on into the battle, as Steve Gleason and a national audience watched on in the first quarter – this happened. And the Dome exploded once again. Electricity pulsed through everyone not wearing red, and some were dizzy with emotion. I just kept yelling, “They blocked a kick for a touchdown! Against the Falcons!” over and over at my lady, Melanie. Wild-eyed high fives were flying everywhere, and even as some seats were noticeably empty, every single one of us in the Superdome knew that the Saints were going to bring home a victory. And it wasn’t even close. P.S. Happy Birthday to Steve Gleason’s son, Rivers, who evidently got the birthday party I’ve been dreaming of for four decades. Even as the Miami Dolphins struggle in the passing game, hashtag Tannehill Problems, former Lutcher Bulldog and Louisiana State University Tiger Jarvis Landry found the end zone on, of all things, the Statue of Liberty play. Landry would not be denied, running through two Tennessee Titan defenders on his way to a 22-yard touchdown. Austin Howard’s four touchdown performance (3 TD’s passing, 1 rushing) wasn’t enough as the Southern University Jaguars fumbled the ball a mind-boggling SIX times, including one fumble at their own 1-yard line that led to the Panthers go-ahead score, in a loss to Prairie View A&M. The mad genius of Les Miles strikes again. With the game tied 27-27, and LSU lining up for an OBVIOUS field goal, because it would be CRAZY to not take the easy go-ahead points, the Tigers shocked the Florida Gators (again) with a fake field goal for a touchdown (again). The ball was ran in, for a lead the Tiger would never give up, by the kicker, Trent Domingue, who says he blacked out during the play. As cooler temperatures prevail and the leaves (in other parts of the nation) take on burnt red and orange hues, the horse racing industry kicks up its heels and rolls out its Fall and Winter Meets around the country. All eyes will look toward the ivy-covered walls of Lexington’s Keeneland Race Course on Oct. 30 through 31, as the Breeders’ Cup runs for its 31st year. A 13-race affair, split up over two days, culminating in the $5 million dollar Breeders’ Cup Classic, which this year will feature, for the first time ever, a Triple Crown champion, American Pharoah. American Pharoah roared into the nation’s living rooms over the spring and summer, sweeping the Kentucky Derby, the Preakness Stakes, and the Belmont Stakes. This colt’s dream season hit a bump in the road as the champion was chased down in the stretch, and lost to, Keen Ice in the Travers Stakes. Keen Ice, a son of Curlin, will also race in the 1¼-mlie Classic, in a rematch from Saratoga. According to Oddsshark.com, even with the loss to Keen Ice in Saratoga, Pharoah will likely go off as the favorite in Lexington. Which would make Keen Ice a value pick as the fifth favorite. You won’t find the second-favorite among the colts or geldings…for the second-favorite to American Pharoah is a filly. A filly many consider to have the ability to take the Classic, that is. Beholder is her name, and winning Breeders’ Cups is her game. She won the Breeders’ Juvenile Fillies in 2012, and took the Breeders’ Distaff in 2013. She didn’t race in the event last year. Beholder is on a 6-race win streak, including the Pacific Classic, where she routed a field of males by over eight lengths. Prick up your ears for this one. It’s going to be a great race. Keen Ice’s main Kentucky Derby prep last year was right here at the New Orleans Fair Grounds, placing fourth to International Star in the Louisiana Derby. It was a beautiful day of racing in front of a packed house. The Fair Grounds holds the distinction as being the oldest site in America with continuous horse racing – they’ve been betting the ponies on that patch of dirt and grass since 1852 when the Union Race Course opened its doors, according to Bob Roesler’s fantastic book, “The Fairgrounds: Big Shots and Long Shots.” Formally established as the Fairgrounds in 1872, the venerable racetrack opens the gates on its 144th season of racing on Nov.19. If you go out for a day at the races, look for me on the rail.